Wine, Cheese and Scrapbooking: Speak ... In Love! What a week!!!!! I have lots of hope about today. Friday, come to me. I need you!!!! Well, after all, each day has it's own purpose. Let's enjoy it! Looking forward to this weekend and to positive things among adversity. Let's speak everything in love. Have a great weekend! Hope you like this card I made. I will link this to Unity Stamp Co's Friday Friends with Flair, so leave a comment for a chance to win. Cute card!! Love that speech bubble! What a great combo of paper and stamps! You always surprise me with your wonderful creations and inspirations. It is a fabulous card. Fabulous little heart speech balloon and love the sentiment!! This is so sweet - love the sentiment! 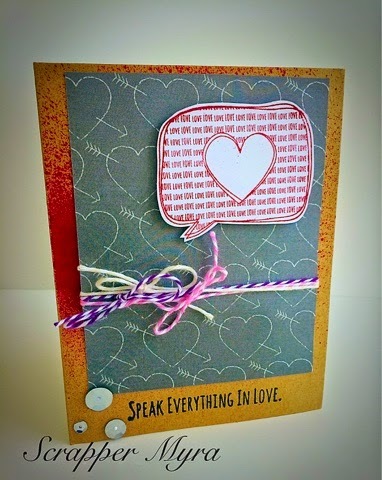 I love everything about this card, and you are right...we should speak everything in love. Such a fabulous card with a wonderfully beautiful message. :) I hope you have a weekend filled with wine, cheese, scrapbooking, and nothing but positivity! Cute card and wonderful sentiment! Love this card! Great eye candy. A sentiment full of wisdom! This is so perfect with your speech bubble stamp!